Please come and celebrate the success of the Democratic Party in Upper St. Clair. 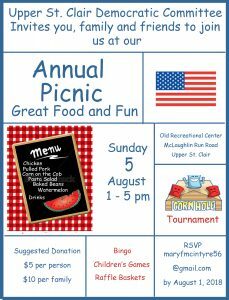 Fresh off victories for Congressman Conor Lamb and Commissioner Elise Logan, and eager to build on the momentum that those victories helped create, the annual Upper St. Clair Democratic Picnic will be held this year on Sunday, August 5 from 1 to 5 p.m. at the Old USC Recreation Center on McLaughlin Run Road (next to the township office and Little League ball field). All USC democrats, along with their families and friends who are interested in supporting or joining the Democratic Party, are encouraged to attend the picnic and meet their neighbors who share in the democratic principles of fairness, equality, compassion and understanding, among others. There will be plenty of good food (chicken, pulled pork, corn on the cob, baked beans, pasta salad and much more), games for kids and adults, raffle prizes and an atmosphere of camaraderie among people who respect and appreciate all that democracy has to offer. While there is no cost to attend, donations of $5 per person or $10 per family are welcome. Come for an hour or for the entire afternoon. Prize baskets will be raffled off at 4:30 p.m., but winners need not be present. DON’T BE BASHFUL. The Upper St. Clair Democratic Committee includes residents from throughout the township, including committeemen and women who you helped elect. The picnic is our way of saying thanks to all USC democrats and a great way for you to show your support of responsible government, not just in Upper St. Clair, but across the country. 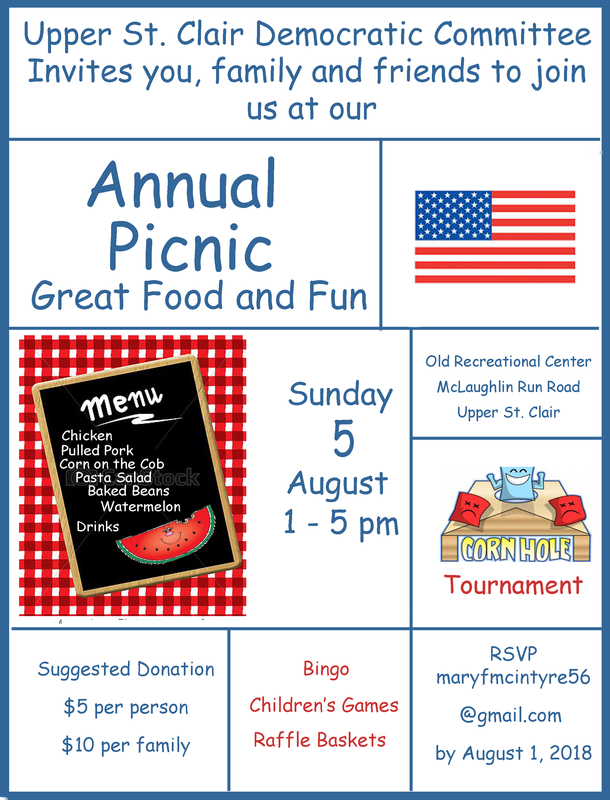 If you would like to attend, simply respond to Mary McIntyre at marymcintyre56@gmail.com and let us know if you and your family/friends will be joining us on Sunday, August 5, 2018 at the Old Recreation Center. We hope to see you there. Paid For And Authorized By The Upper St. Clair Democratic Committee.